Try these exercises to help you reach your goal on race day. Cross-training is an excellent way to supplement your running, building strength and flexibility in muscles you do not normally use. 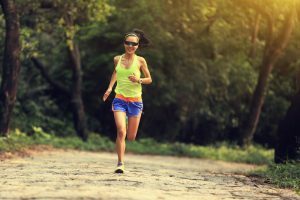 There is a plethora of information out there on cross training but in an effort to simplify it, here are four rules of cross-training that will help you reach your desired goals as a runner. Choose the right workout. It is important that you take the time to identify what your end goal is and what you want to get out of your cross-training. If you are looking for core stabilization and strength, opt for some Pilates work. Look for online videos or hit up a class at the local gym. If you need something restorative, opt for yoga. Yoga not only restores your body but it also improves your breathing, mobility and core strength all at once! Looking for a longer workout with a little more impact? Hit up the gym and do some reps with barbells, kettlebells and dumbbells. These exercises are all essential to adequate strength training for runners. Add regular strength training to your routine. Whole body strength training should be implemented 1-3 times each week. This will take your running to the next level. Deadlifts are a great option when strength training as they train muscles that you do not regularly use when running, working your hamstrings, glutes and core. They also help to improve your posture, which betters your running form! Another great strength training exercise is the overhead press. This exercise improves shoulder strength and mobility, which can contribute to a better arm swing when running. Don’t replace running with cross training. Cross training helps you to mimic a run workout without adding as much of a pound to our joints. Some runners inadvertently replace runs with cross training because of this. Remember that cross-training workouts will not help you to reach all of your goals by race day. Running should still be the focus! If you want to change things up, you can hop on a rower or bike or even jump in the pool to get a similar workout impact as you would on the pavement. Interval workouts transition easily for runners. Include HIIT if when you are in the off-season. After race day, you can train however you want. During the off-season, you can train like any athlete. Although it is advised that runners avoid HIIT when leading up to race day, you can dive in head first after the big day. Circuit-style fitness and bootcamp classes are excellent options for a workout that is already laid out for you. Otherwise, you can create your own workout that will get your ticker pumping. Apprehensive about switching from the pavement to the dirt? Press on with confidence with these tips! There are benefits to running on both the road and the trail. 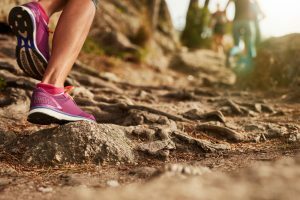 If you have yet to try trail running or are somewhat nervous about setting foot on the trail, these tips will help prepare you so you can benefit from trail running too! How is Trail Running Different from Road Running? If you run on pavement, chances are you have a couple routes you frequent when getting a workout in. You also may have grown bored of looking at the same things or feeling the same at the end of a run. Most pavement is on flatter terrain, which keeps your fitness level at a certain point without challenging you much. Trail running is tougher, as there are more uphill and downhill treks. You may have to be a little more agile too, navigating around tree stumps, streams, rocks or perhaps even some wildlife. Trails can change from day to day with new challenges and obstacles which can enhance your workout. At the end of a workout, you may feel different depending on your path for the day. You could feel strong, prepared, defeated or weak. Weather conditions and views change during trail runs. Challenges keep you awake. Trail running can keep your training fresh while expanding your options and giving you some beautiful ever-changing scenery along the way. Enough with the convincing of why you should try trail running – here’s how. Release your expectations. It is a good thing to be eager to begin a new workout but be careful to not bite off more than you can chew. To avoid burnout or injury, start out with an open mind and no expectations. Begin with a mileage you are familiar with. Maybe even drop down a mile or two from your normal distance because the trail can be a bit more challenging. Your run volume is going to take more effort and time to take on. Expect increased muscle soreness as well due to increased technical stepping and elevation changes. Also, forget your paces. Your moderate effort pace will undoubtedly change when you set foot on the trail due to the aforementioned hills and obstacles. Simply allow your general level of effort to guide you as you propel forward. Run at a pace that is comfortable. Keep in mind that your pace may change to match the portion of the trail that you are on. Over time, you will gain a better understanding of your pace on trails and how and when to push your speed. Enjoy the run. Although the switch can be tough, it is so rewarding. The challenge of trail running will equip you to be a stronger runner. And while being challenged, enjoy the beauty of nature away from all of the regular distractions of life. No stop signs or lights, no cars, no polluted air, and minimal people. A trail is a place where you can focus on yourself and your goals, surrounded by beauty and with minimal distraction. Learn More And Get Involved in the Running Community! They say that knowledge is power — so here are six online resources that offer information on everything from injury prevention to marathon optimization to news and current events in the running community. This online/print magazine has literally thousands of published articles available for free on its website. The majority of this content is relatively short-form and tends to provide overviews rather than in-depth explanations — nonetheless, because articles are published so frequently, this is one of the best resources for anyone interested in staying up to date. For American runners, this site is the go-to guide for in-person races and events. Self-described as the “Largest database of races and clubs,” Running in the USA is a wonderful resource that has helped countless runners connect with their local communities and participate in exciting runs. Another online/print hybrid; this one offering slightly more quality and depth than Runner’s World, but with a slightly less comprehensive and set of archives. One topic that Running Competitor does cover quite expansively, however, is injury prevention, so anyone concerned about topics such as pulled muscles or tweaked tendons should be sure to check out this publication. For any runner who wants to cross that 26.2 mile threshold and accomplish the rare feat of finishing a marathon, this is an important resource. Here you will find progress plans, diets, and other specific information tailored specifically to the super-athletes like you who dream big and train hard. For those not familiar with Reddit, the so-called “front page of the internet” is a forum-based website that allows users to post and discuss content from across the web. This leads to a broad mixture of both resources and quality, but because visibility is based on a democratic voting process the best of the best is usually pretty easy to find. Alternatives to the Reddit “running” community include r/racing, r/couch to 5k, r/first marathon, r/raceit, and r/trail running. Animal lovers, be sure to remember to check out the ever-popular r/running with dogs, too! Our expansive database of running events includes dozens of virtual races that can be completed in from anywhere in the world, giving you the opportunity to continue progressing as an athlete and participating in the running community wherever you may be. The Virtual Pace Series blog contains dozens of articles offering information, news, and advice for runners. We truly believe that our philosophy on running, along with our inspiring company story, contributes to the sport in a unique and innovative way! Sign up for Virtual Pace Series today for more information on running your first virtual race! https://www.virtualpaceseries.com/wp-content/uploads/2018/04/Blog-image-VPS-2.png 167 451 Bearly Marketing https://www.virtualpaceseries.com/wp-content/uploads/2016/12/VPSlogo-copy.png Bearly Marketing2018-04-11 18:57:522018-04-11 18:57:52Learn More And Get Involved in the Running Community! 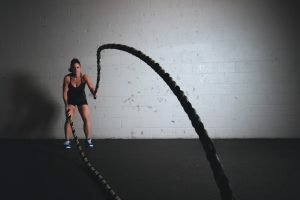 Whether you are a seasoned marathon runner looking to take your training to the next level, or a brand new runner trying to maximize your initial gains while minimizing soreness, the benefits of cross-training are numerous. 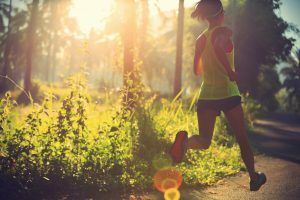 Virtually any type of physical activity can be helpful for your running — from yoga to polo, simply finding an engaging workout that you enjoy is the most important step. 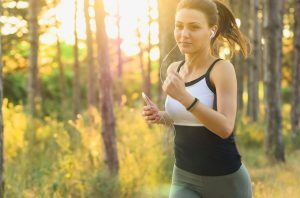 However, for the sake of showing off some examples, this article will discuss four of the most popular forms of cross training and how they help runners just like you to reach their short and long-term fitness goals. 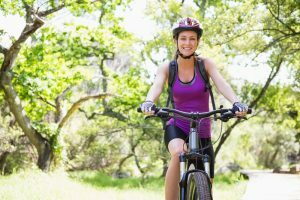 From mountain biking to street cycling, riding a bike is an obvious choice for runners simply because it is accessible and offers similar physical demands to running. It elevates the heart rate, requires a fair amount of stamina, and is leg-driven. However, there are a few differences from running, too. One of the biggest appeals of cycling is that it lower-impact: runners who struggle with joint pain or other frequent injuries will be happy to substitute some of those pavement-pounding jogs with a bit of peddling. Biking can also be a good muscle-builder, especially for trail-based bikers who like hitting inclines. Water aerobics are even lower-impact than cycling, so this is another fantastic choice for people who want to be careful and conscientious. Swimming won’t build leg muscle in the same way that biking could, but it does offer the benefit of being an extremely well-rounding exercise that contributes to core strength and upper-body stamina. A strong core allows runners to build endurance and maintain better posture even when fatigued, so long-distance runners are ideal candidates for a swimming cross-training routine. Sprinters and even 5K runners tend to work for a different build than what marathon runners aim for — so if you are a short-distance runner who wants to add a bit more drive and power to your stride, then pumping some iron might be a good choice for you. 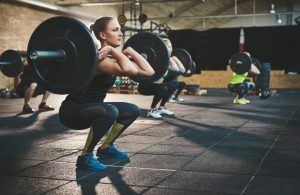 Weight lifting also adds definition and stamina that is enviable for nearly all athletes, though; and even marathon runners have been known to adapt a light-weight high-repetition weight lifting routine for the purpose of strengthening their cores while looking and feeling great. Competition brings out the best in most athletes — as does consistency. And because the ‘fun factor’ is crucial to remaining consistent even on those days when you are feeling too busy or worn out to continue, we highly recommend finding a sport you are passionate about. 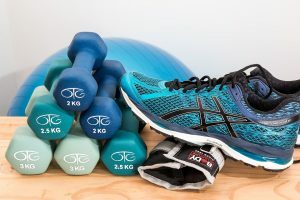 This could mean heading down to the courts at the gym, joining the company softball team, or even signing up for virtual races: whatever you need to do to stay competitive and motivated for the long haul. An added bonus for these kinds of activity? They are a great way to make friends and stay engaged with your community!